He remembers how he was able to ditch his sister, thanks to getting to hang out with Steve. University counselor Ciarra Walker is involved with the young adult ministry at her church and is always looking for ways to give back to the community. Rodriguez was just 10 years old, and he remembers so much about his Big Brothers Big Sisters mentor. Steve made such a powerful impact on Rodriguez’s life — something the GCU employee is hoping to do himself. Employees spent their lunch hour picking up flyers and business cards, meeting people in the know who spoke about how their nonprofit serves the community, and signing up to be a volunteer themselves if they found a community service organization that spoke to them. Big Brothers Big Sisters of Central Arizona spoke to Rodriguez. The former “Little” jotted his name down on the organization’s signup list during the Volunteer Fair, which put the spotlight on such groups as the American Cancer Society, Be a Leader Foundation, Catholic Charities Community Services, Feed My Starving Children and Phoenix Rescue Mission, to name a few. “I wanted to pay it back,” Rodriguez said of signing up to possibly be a “Big” at the Big Brothers Big Sisters booth. More than 20 GCU-supported nonprofits were at the 27th Avenue office building Wednesday to connect with employees. Rodriguez isn’t new to volunteerism. He gave his time last summer to the Back to School Clothing Drive at GCU Arena, where more than 4,500 children whose families don’t have a lot received clothes, backpacks and more (the drive returns to the Arena on July 21-27, and volunteer registration is open). Rodriguez wasn’t the only GCU employee looking for a way to give back. University counselor Nicholas Gaunt also took some time out on his lunch break to visit the aisle of booths at the Volunteer Fair, his box of pizza lunch in his hand along with a flyer he just picked up from Arizona Facts of Life, a nonprofit whose purpose is to guide young people to success by providing developmental opportunities, such as facilitating college campus tours, organizing leadership development workshops and providing family counseling. Gaunt said he grew up in difficult circumstances and, like Rodriguez, knows the importance of mentors to a child who needs one. “I’ve had some experiences in my life during my youth that made me who I am now,” he said. He might not have made it through those hard times as successfully as he has without those many mentors, he said, from his church community to close family and friends. 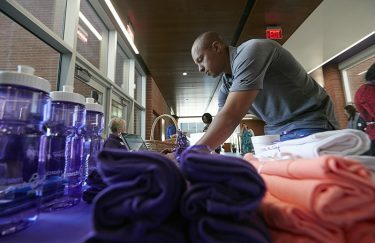 Employees learned about some of the nonprofits supported by GCU. At GCU, he said, he’s able to impact people by pointing them to college. Still, he finds time to volunteer. 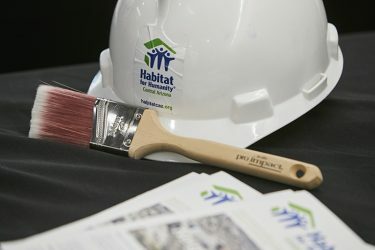 “If I can be a positive influence in that area, I will,” said Gaunt, who is getting ready to work on a Habitat for Humanity project in June along with a team of co-workers – GCU has the largest contract in the world with Habitat for Humanity Central Arizona with a goal of rejuvenating 700 homes over the next three to four years. University counselors Savannah Vaninetti and Ciarra Walker also have worked on Habitat for Humanity projects with their co-workers. But Walker was there, too, to look for opportunities outside of those afforded to her by GCU. The University supports campus volunteer efforts by providing eight hours of community service time every six months to employees, meaning employees may volunteer during work time and still be paid for those hours. 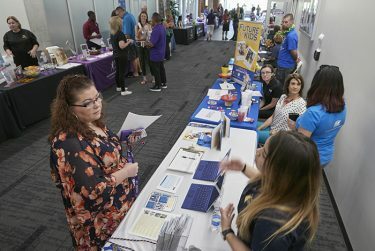 This is the second year for the Volunteer Fair, which focuses on volunteer opportunities for employees at a time when the campus has quieted a bit after students have gone home for the summer. Not that the fair was limited to employees. Kaeman Mitchell, coordinator of L.O.P.E.S. 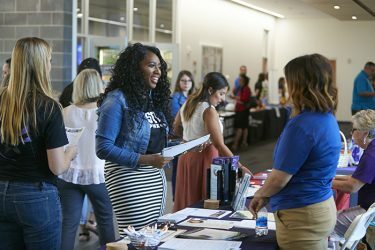 for Life, was at the event to find ways to connect GCU’s student-athletes to volunteer opportunities. In the 2017-18 academic year, he said, student-athletes contributed 3,200 community-service hours. “We’re just looking for more ways to get our students involved,” he said. Communications Outreach Manager Debbie Accomazzo, the event’s organizer, said the fair provides a venue where nonprofits can meet employees who want to give their time: “This is kind of our matchmaking opportunity,” she said. Habitat for Humanity was one of the organizations represented at the fair. The 27th Avenue office building, with the largest concentration of employees on campus, is a prime spot for the fair. It’s also a building whose employees are known around campus for their strong volunteer team efforts. Arizonans for Children, a nonprofit close to campus, at 11th Avenue and Camelback Road, was one of the nonprofit organizations at the fair. It provides various programs for children in foster care, including a visitors center so children in foster care can have supervised visits with their parents along with a craft program, jewelry class and even a STEM class (science, technology, engineering and math) where children learn coding and play Minecraft. “We’re definitely looking for mentors to spend eight hours with kids in foster care and to volunteer for our visitors center,” said Jeff Jayne, Tutor/Mentor Coordinator. The Be Kind Project was another one of the nonprofits at the fair. The organization’s vision is to build a generation of respectful, responsible, healthy and caring citizens and leaders. “We go to schools all across the country, showing kids that it’s cool to be kind,” said Tori Jones, Manager of Volunteers and Operations. I would like to volunteer. I am international student who is enrolled for evening classes therefore having a lot of spare time during the day. I would like to be part.